Editor’s note. At a press conference this afternoon, the National Right to Life Committee endorsed pro-life Karin Housley in Minnesota’s Senate special election. Her opponent will be pro-abortion Tina Smith, who was appointed by Gov. Mark Dayton following the resignation of pro-abortion Sen. Al Franken. I am pleased to be with you today in the great state of Minnesota. 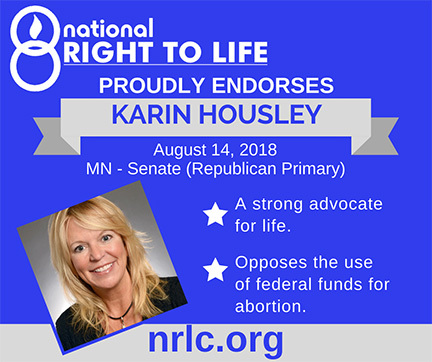 I have the honor of announcing that National Right to Life has endorsed Karin Housley for U.S. Senate in the special election this November. There is a stark contrast between Karin Housley and Tina Smith, appointed by Governor Mark Dayton to fill an open seat. Karin Housley supports legal protection for unborn children while Tina Smith supports abortion for any reason until birth. Karin Housley supports the Pain-Capable Unborn Child Protection Act – legislation that would protect unborn children by prohibiting abortion after 20 weeks, a point by which the unborn child is capable of experiencing great pain when being killed by dismemberment or other late abortion methods. Tina Smith voted against the Pain-Capable Unborn Child Protection Act (S. 2311, 1/19/18, Roll Call No. 25) in the U.S. Senate. As a former lobbyist and vice president for the Minnesota Planned Parenthood affiliate, Tina Smith supports giving hundreds of millions of your tax dollars to the nation’s largest abortion provider. And while Tina Smith supports using your tax dollars to pay for abortion, Karin Housley does not. I grew up in your neighbor state of North Dakota. Both North Dakotans and Minnesotans have a deep respect for innocent human life. I have no doubt that, during the coming campaign, Tina Smith will try to obfuscate the issue of abortion, telling voters that she supports women’s health and reproductive choice. What she will not clearly lay out for the voters is her true position. Tina Smith will do everything she can to make sure that the ability to kill unborn children for any reason, through all nine months of pregnancy, remains legal. If you think women should get information about abortion, possible complications, and available alternatives, Tina Smith does not, and will not, represent you. If you believe parents should be told that their minor daughter is seeking an abortion, Tina Smith does not, and will not, represent you. Out of 108 worldwide studies published on abortion and breast cancer, 73% of the studies found an increased risk between induced abortion and the later development of breast cancer. If you think women should be told about even the possibility of an increased risk of breast cancer following an abortion, Tina Smith does not, and will not, represent you. If you think abortion facilities should have to practice the same health and safety standards as ambulatory surgical centers, Tina Smith does not, and will not, represent you. If you think unborn babies who have developed to the point where they can feel pain, at least by 20 weeks gestation, should be protected from abortion, Tina Smith does not, and will not, represent you. If you think a preborn child should not die by having her arms and legs torn off in a gruesome dismemberment abortion, Tina Smith does not, and will not, represent you. If you oppose having your tax dollars used to pay for abortion, in this country and in other countries, Tina Smith does not, and will not, represent you. If you believe that health care providers and others should not be forced to participate in the brutal act of killing an unborn child, Tina Smith does not, and will not, represent you. Karin Housley’s position on life reflects the true values of Minnesota’s voters. She will support common sense legislation that represents you. I urge all voters in Minnesota to elect Karin Housley to the United States Senate.